A match made in Wedding heaven for all brides-to-be out there! 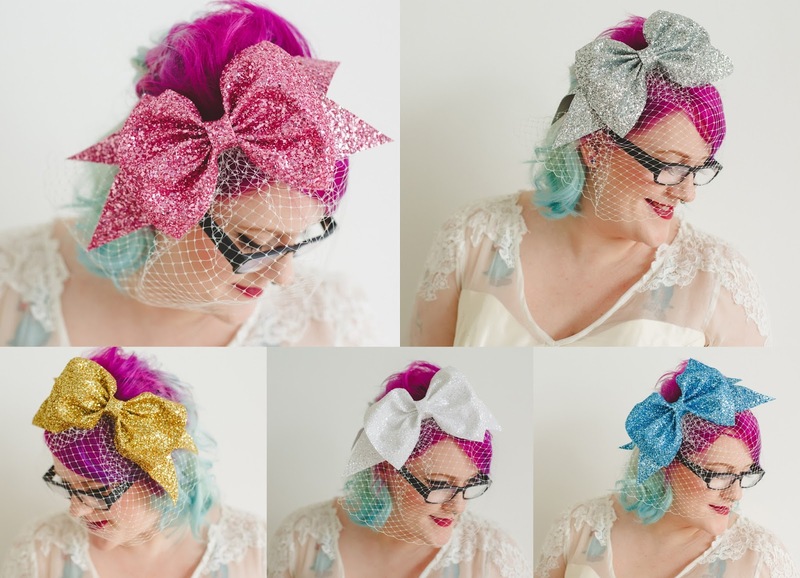 Kat Williams from Rock n Roll Bride has teamed up with Crown and glory Accessories to produce a bridal accessories collection that has got me swooning all over the place. 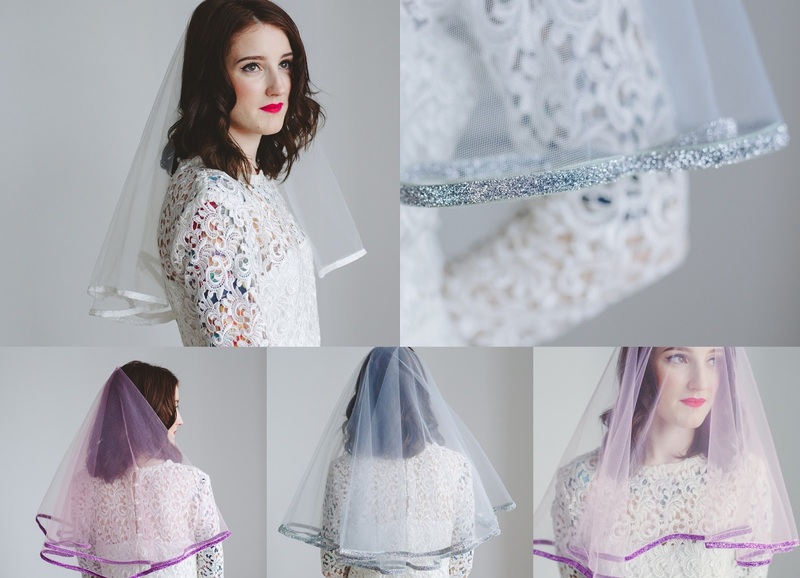 The collection is all about the wedding veil. 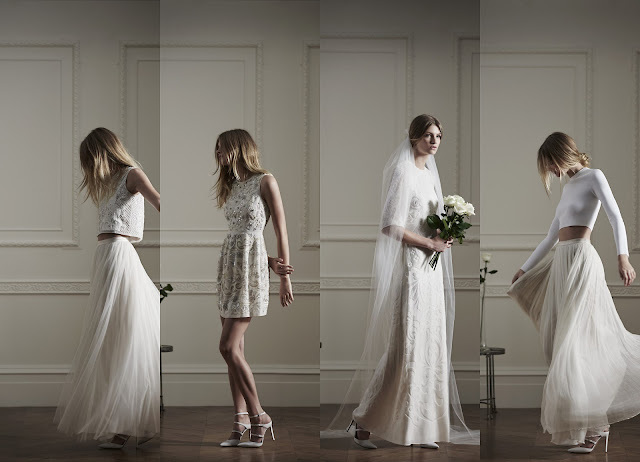 Made up of six pieces, which can all be customised to suit the bride's individual style. 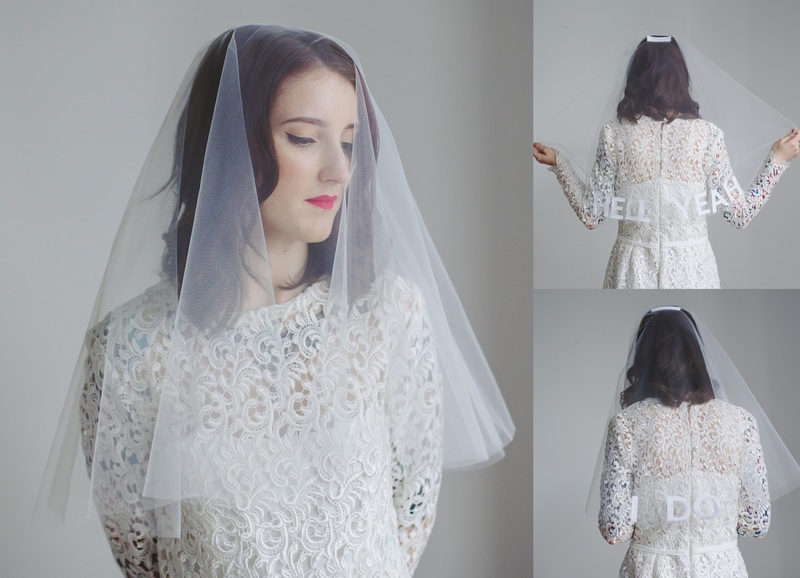 Flocked-velvet white letters on a double layer, ivory shoulder length circle veil. Also includes a clear comb attachment with flock velvet detailing. Brides can add their own name/word/slogan as a note during checkout (up to 12 characters). 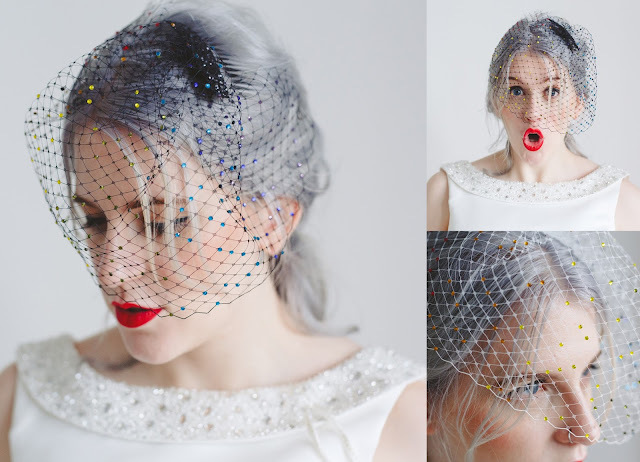 A hand-embellished gem heart is attached to a silver tone alice band, and a colour-matched birdcage veil. Available as standard in silver, pink, black and gold (with custom colours available on request). 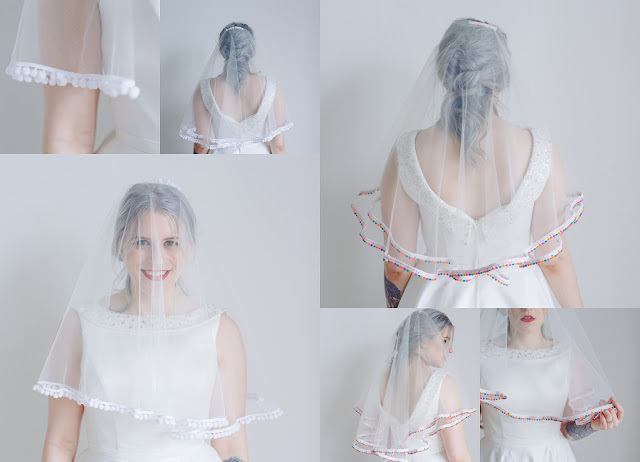 Pom-pom edging in ivory or rainbow attached to a double layer, ivory shoulder length circle veil. Also includes a clear comb attachment with additional pom pom detailing. Each piece is handmade-to-order and costs from £30 - £50 meaning they are also fantastic for brides on a budget. They all come beautifully wrapped in a branded dust bag or gift box to protect the veil before and after the wedding. Double-sided, non-shedding glitter trim on a double layer, colour-match shoulder length circle veil. Also includes a clear comb attachment with glitter trim detailing.Available in classic ivory, baby pink or soft dove grey. Available in 30 super sparkly colours, each bow comes attached to an ivory birdcage veil on a comfortable silver tone alice band. The collection is available to buy now from Crown and Glory. Hi. 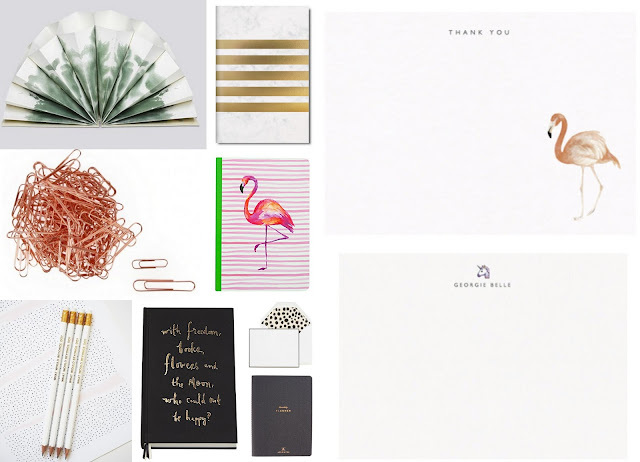 My name is Laura, and I have a stationery addiction. Aside from visiting the beauty halls of department stores, you'll also find me in the stationery department getting all excited over notebooks, or card sets. I'm a total sucker for an eye-catching piece of stationery and have a whole drawer full at home. Above are some of my favourite pieces, and places to buy stationery. Whether it's for yourself, or a gift - you'll find the perfect pieces at these stores. I mean, you can't go wrong with some Emoji notecards, right? Every now and then, I decide I don't like our flat. I'll get really fidgety and feel fairly unsettled but, the following week I'll be fine and totally happy with the place again. Over the Christmas break, when I had a few days of just hanging around the flat, I found myself really not loving our living room - I even went as far as not spending time in there and staying in the bedroom! 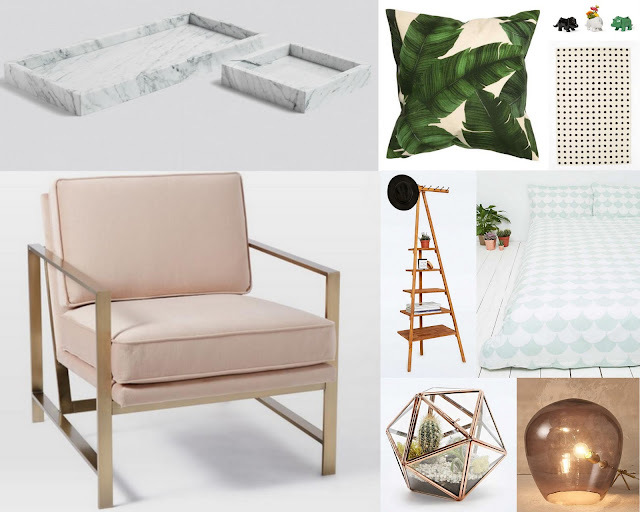 So, I decided the only thing for it was to bring in some new bits of homeware - just to give it a new lease of life, and make it feel like the room I fell head over heels with when we first viewed the flat three years ago. Now, I spent a fair few days (yes, days) pouring over Pinterest, blogs and websites until I decided to buy the sofa some new cushions - seen above in the picture, and keep the fairylights in our big fireplace instead of packing them away with the rest of the Christmas decorations. Already the room felt so much nicer than before, and I'm now thinking about what to get come payday. Above are a few pieces that caught my eye. I've got to say, I was surprised how much Urban Outfitters have that I liked! Check them out, plus the others below if you need some new bits for your place. Hot damn! Karlie Kloss is the new face of Kurt Geiger, and boy is she killing it in their SS16 ad campaign. The mood of the collection is energetic sports-luxe, where fashion pumps iron to powerful effect. Ditching strict fitness time, bags and shoes are designed to run wild in anytime. Flexible materials and effortless swimwear, sport sandal hybrids, sneakers in soft snake-cut leathers and frilly flatforms are made for fashion on the go. The bags have got very sassy for the new season, and there are more than a few I have my eyes on. A new ‘Annie’ belted bag works hard with multiple ways to wear it. Crafted in exotic ostrich embossed leather, liquid silver or classic woven textured leathers, ‘Annie’ is casual glamour and can be worn as a bum bag, shoulder bag or pouch. A new soft, sporty hobo joins fresh iterations of the brand’s signature bags. In a mile-a-minute life, the ‘Penelope’ hobo bag can be customized with detachable tassels, statement chains and personalized with Perspex charms. Kurt Geiger SS16 is looking mighty fine. - my wish list is already big! Shoes and accessories including Kurt Geiger London, KG Kurt Geiger, Carvela and Miss KG have started landing in stores and online at KURTGEIGER.COM now. So after putting the plans on hold for the last few months of 2015, it’s time to get back to wedding planning! Things are really put in to perspective when someone close to you falls very ill, and I was most definitely not in the mood to talk/think about pork pies and cheese with potential caterers, or even think about dresses. Throughout the next few months or so, you’ll all probably start to realise that I’m not a “typical” bride, whatever that may be. Sure, I have spreadsheets, a couple of Pinterest boards and I can spend a whole day pouring over the latest issue of Rock n' Roll Bride Magazine. But, when people ask how the planning is going, they're surprised to see how laid back I am about it! People keep asking me if we have a ‘theme’ or colour scheme, and to be perfectly honest we don’t. 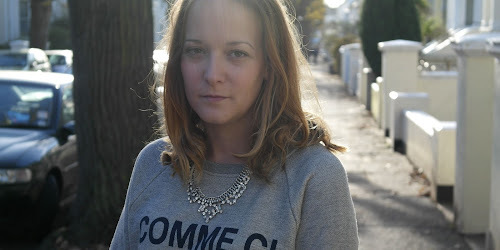 We want it to be casual, informal, fun and personal. For us, it’s about having all our favourite people under one roof and celebrating with them all. There are so many traditions when it comes to a wedding that just aren’t very us and we have both agreed it would be weird doing them, as they don’t mean anything to us. We’re doing it our way and although we’ve already had some raised eyebrows along the way (no top table or first dance – gasp!) we don't want to feel like we're playing a role on our day. We want it to feel as personal as possible. 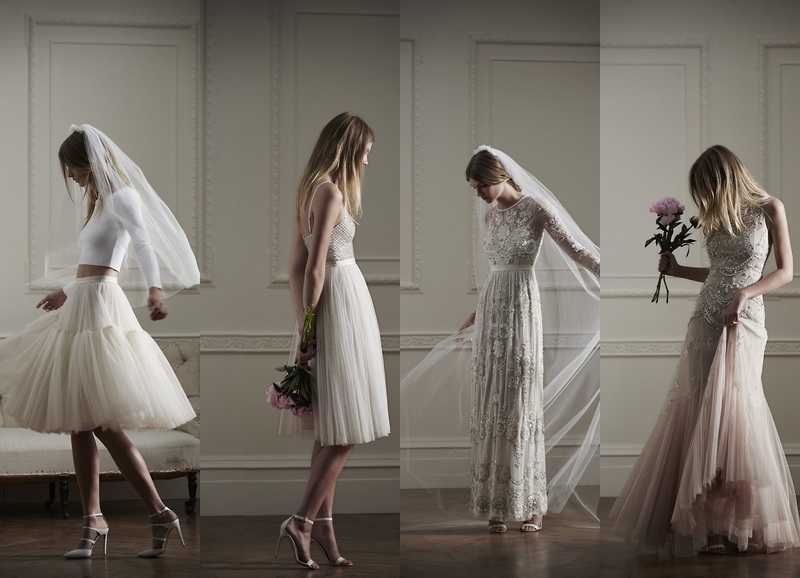 One tradition I am sticking to are having bridesmaids (see how I asked them here) But, I won’t be putting them in tulle or taffeta – I just want them to feel comfortable. So, I’ll be letting them choose a dress/outfit they love. 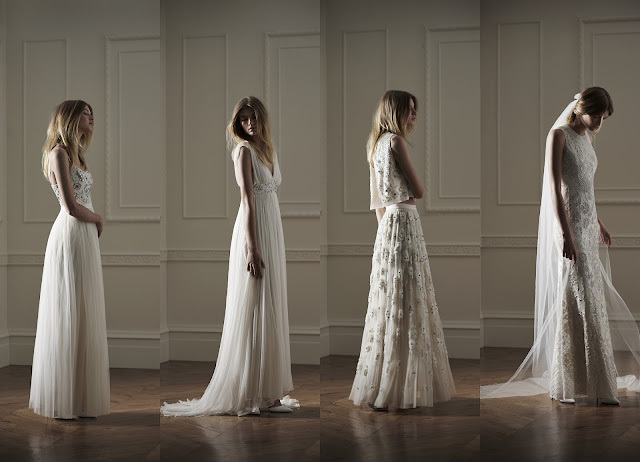 I’m already keeping an eye out for various dresses – holla if you see any that are nice but not too bridesmaid-y. It's YOUR day: As I mentioned above, we've already had a few raised eyebrows along the way however, we've been taking them with a pinch of salt. You need to remember that you won't please everyone with your ideas but, don't let that affect you and your partner - it's your day after all and you only plan on getting married once! Budget: Like most weddings, this one is on a tight budget. Before you do anything, figure out what elements of your day you want to be extra special, and budget for those. For example, food and drink are important to us. Believe me, it may seem daunting at first - especially when you start receiving quotes from suppliers but, get your negotiating skills at the ready and see if you can knock a few quid off. Every little helps after all. When you feel yourself getting stressed, take a step back for a few days or if you can, pass it over to someone you trust. Remember stressing over flowers or different coloured napkins is so silly! Don't get too immersed in lots of wedding websites or blogs. I got so overwhelmed last year by what was on offer, that I decided to focus on a couple of my favourite wedding blogs and magazines. You'll find that it will give you a clearer idea of what you see yourself doing for your day. More on that in another post! If you have any planning tips - please send them to me! My blog is going to feature more wedding content this year. From planning tips, to Bridal make up. 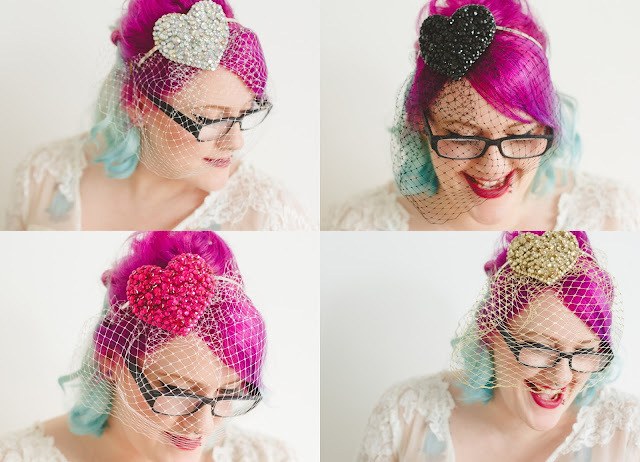 If you have any wedding-related subjects you would like to see on here, please get in touch. Now it's January, and the weather seems a tad colder I am finding myself in full-on Winter mode. The central heating is on, and the fleece-line opaque tights (yes, they really do exist!) have been taken out of storage. I'm finding that I am starting to embrace this weather one Aran knit at a time. 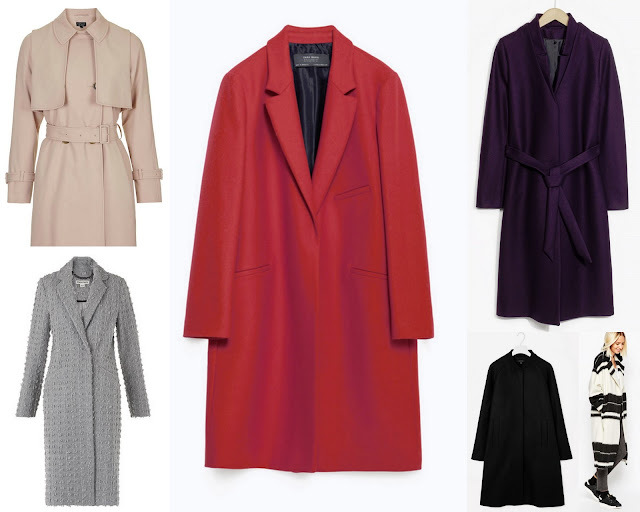 There are a lot of coats in the sales at the moment, so I’ve included a few of those in the edit – January is a thrifty month after all. The back to work blues have kicked in, and this weather is not helping. 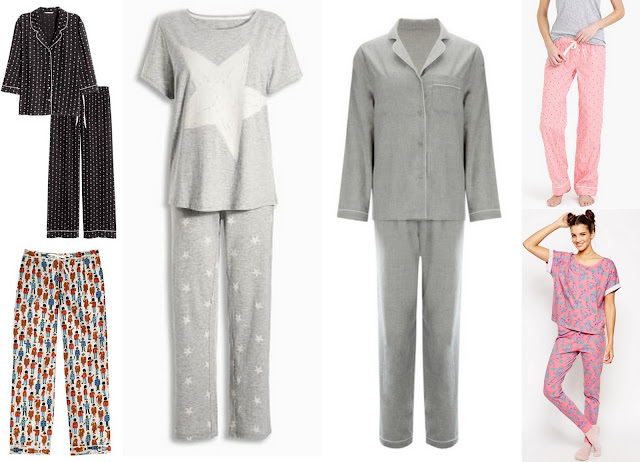 This week’s edit is focusing on Pyjamas. I pretty much lived in them over the festive break and, they are the only thing that feel comfortable to wear after my massive Christmas cheese binge - elasticated waist bands are my new BFF. If only I could wear them at my work desk! Check out my favourites above. All under £50 as well so they won’t break the bank. 2015 was the year I properly got in to beauty products. I paid more attention to skincare and purchased my first ever eyebrow pencil. It was a long time coming, and a total face-changer! I've been using the same brand of mascara for a couple of years now (YSL Babydoll, FYI) and, although it's still a staple in the ol' makeup bag, I thought I'd change it up halfway through the year and give this one a shot and, I'm so glad I did! I have short lashes that refuse to curl but this little pink tube of magic has changed that. A replacement for my trusty everyday YSL mascara? Quite possibly. I should probably say that 2015 was the year I also discovered makeup brand, Charlotte Tilbury and I'm obsessed! Every product I've used has impressed and the packaging is totally instagrammable as well. This Mini Miracle Eye Wand does exactly what it says on the box, and has fast become part of my everyday makeup routine. I first mentioned this product back in July, saying it ticked all the right boxes. It still does, and is now a permanent product in my makeup collection. Complexion Rescue is easy to apply, blend and will not make your face feel 'heavy' (y'all know what I mean!). Plus, it has SPF30 in the formula, leaving your skin with a hint of a glow. This product has also found it's way into my makeup collection. Perfect for day to night, Burberry Kisses Lipsticks are hydrating and don't slip off your lips. Plus, they stay put for hours and you'll only need to have a little touch up when you're eating and drinking. In the latter part of 2015, I started playing around a lot more with eye shadows. CT's Eyes to Mesmerise cream eyeshadows were top of my wishlist, and I purchased Bette and use it as a different take on a smokey eye. They blend well and the colours are amazing plus, a little goes a long way. Perfect for travelling and for those who can't bear the smell of nail polish remover. Hands down, best hairbrush ever - it's even better than the Tangle Teezer. Serious. I can't say enough good things about it. It glides through tangles easily, with hardly any hair falling out. Stocked on Cult Beauty and I swear I saw it in the Beauty hall in Selfridges, this tangle-busting brush is a must have for anyone. This is the newest addition to my Makeup drawer, and I haven't looked back! I don't know how CT does it but, following her instructions on how to apply the Face Sculpt and Highlighter it really does what it says on the box. Just like all her other products I've tried and tested over the year. CT really is my makeup BFF right now. Last but not least, as I said at the beginning of this post, I've been trying to look after my skin more this year. After trying out a few 'high end' skincare brands, I finally found one I liked. Sunday Riley is known for her skincare, and although her products are a tad on the expensive side, they are totally worth it in my opinion. And there you have it. 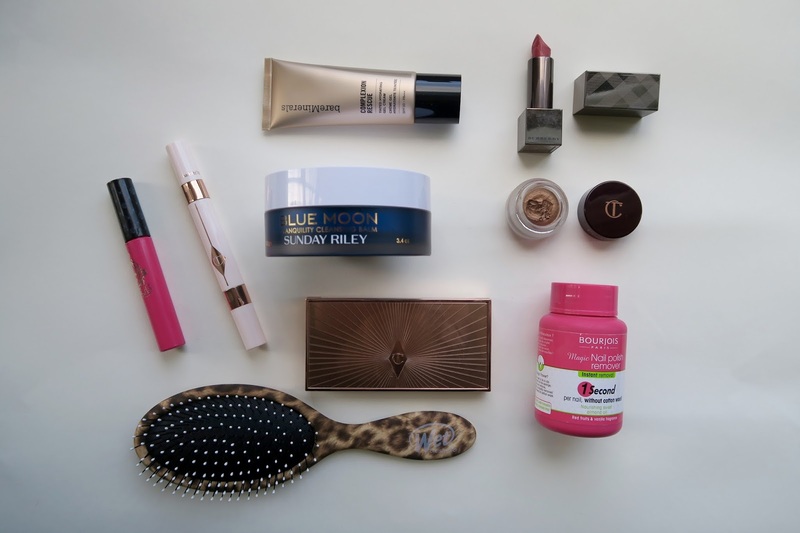 My favourite beauty buys of 2015. I'm looking forward to seeing what 2016 will bring.